Chris Dench was born in London in 1953; he is self-taught. After periods living in Tuscany and West Berlin, the latter as a guest of the DAAD Berliner Kunstlerprogramm, he finally arrived to settle in Australia. He became an Australian citizen in 1992. His commissioned works include symphony 4/propriocepts for four amplified voices and large orchestra (1994-97) for the ABC, premiered by the Adelaide Symphony Orchestra/David Porcelijn in April ’97; symphony 3/afterimages (’87) for the BBC; e(i)ther for the ’05 Huddersfield Festival; the blinding access of the grace of flesh (’03) and ik(s)land[s] (’97-8) on texts by Berni M. Janssen, and ‘e/meth (’95), for ELISION; light-strung sigils (’01) for Music of Changes in Los Angeles; eigenmomenta (00-1) for Libra; heterotic strings (’93) for austraLYSIS; driftglass (’90) for ELISION, which represented Australia at the ’92 Paris Rostrum of composers; strangeness and the eightfold way (’85) for the Arditti String Quartet, énoncé (‘83-4) for the French Ministry of Culture, premiered by the London Sinfonietta at the ‘83 Metz Festival, and many others. ELISION performed ik(s)land[s] at the Philharmonie in Berlin in March 2003, and The blinding access of the grace of flesh, at the Konzerthaus am Gendarmenmarkt in Berlin for the LiteraturWERKstatt Festival on July 3, 2003. His works have also been performed by Ensemble Accroche Note of Strasbourg, the Berlin Radio Symphony Orchestra, ensemble Expose, Ensemble InterContemporain, Ensemble Phœnix of Basel, ensemble Topologies (who take their name from his ’79 piano piece Topologies), Music Projects/London, and the Xenakis Ensemble, with such conductors as Simon Bainbridge, Peter Eötvos, Sandro Gorli, Cristobal Halffter, Huub Kerstens, Diego Masson, and Franck Ollu, and such eminent solists as Julie Adam, Pierre-Yves Artaud, Andrew Ball, Giuseppe Bruno, James Clapperton, Michael Finnissy, Kathleen Gallagher, Richard Haynes, Rolf Hind, Stephanie McCallum, the late Yvar Mikhashoff, Geoffrey Morris, Peter Neville, Marilyn Nonken, Michael Norsworthy, Ian Pace, Rocco Parisi, Jonathan Powell, Michael Riessler, Stephen Robinson, Carl Rosman, Todd Seelye, and Claudio Santambrogio. Portrait CDs of his music include Beyond status geometry (Tzadik, New York, 2008) ik(s)land[s] (NMC Records, London, 2005) and Music for Flute 1986-91 (Etcetera, the Netherlands, 1993). Other CD releases include his severance for guitar on the AMC label Vox Australis, a piano-roll version of his Pas Seul I: reading Takahashi on a CD from Los Angeles, all his flute music on a CD from the Etcetera label in Holland, and several others, totalling fourteen in all. In May ‘02, the Melbourne-based group Libra gave the first, extremely successful, performances of his percussion quartet beyond status geometry (’94) which had previously been deemed ‘unperformable’. In the same season, they gave the Australian premiere of light-strung sigils - both appear on the Tzadik CD Beyond status geometry. Their long association with Dench’s work has included the world premieres of eigenmomenta and asymptotic freedom, and they have performed many of his other works. In November ’03, Libra hosted a complete performance of all the finished sections of his large-scale set of piano pieces, the Phase Portraits, performed by Mark Knoop. He has been the subject of composer portrait concerts under the auspices of the Almeida Festival in London (’86), the Kunst im Wissenschaftszentrum series in Berlin (’89), the Huddersfield Festival (‘92), the debut concert of Ensemble Topologies in London (’95), and Music of Changes in Los Angeles (’02), and his works have been presented at such events as the Ars Musica Festival in Brussels, the Brighton Festival, the Damstadt Ferienkurse fur Neue Musik (at which he was awarded the Kranichsteiner Musikpreis of composition in ’84), Fylkingen in Stockholm, Gaudeamus Musicweek, the Hong Kong ISCM/ACL World Music Days, the Inselmusik and Inventionen Festivals in Berlin, the Kings Lynn Festival, the La Rochelle Festival, the Metz Festival, the Middelburg Festival, Musica Attuale ’92 in Bologna, Musica nel Nostro Tempo in Milan, the Schreyahner Herbst Festival, the Musica Nuova per l’Europa event at the Accademia Chigiana in Siena (released on a Fonit Cetra CD in ’89), the Musica Festival in Strasbourg, the Festival Rive-Gauche in Turin, the Sydney Spring Festival, the Biennale di Venezia, and elsewhere - most of these performances were broadcast. More recent performances have taken place in Switzerland, the USA, Norway, Taiwan, and even in a tent in the Gobi Desert. Between 1986 and ’91 he wrote a series of four large-scale solo flute works: Vier Darmstädter Aphorismen, dé/ployé, sulle scale della Fenice, and Closing Lemma, which Paul Griffiths calls ‘important’ and ‘remarkable’ in his book Modern Music and After (OUP ’95). 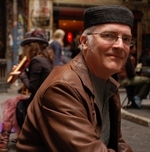 His 1992 work for Roger Woodward’s Alpha Centauri Ensemble, planetary allegiances for flute and ensemble was included in the group’s ’92 European tour; it was featured in a BBC-TV documentary on the Grateful Dead/Rex Foundation. Other TV use has included excerpts from funk (‘88-9) on SBS’s Imagine, and driftglass on both Paul Grabowsky’s Access all Areas, and the Northern Territory Edition of the Holiday Show, both on the ABC. ELISION’s performance of funk, featuring Carl Rosman on bass clarinet and Peter Neville on percussion, won the ’96 Sounds Australian Award for best performance of an Australian Work. Symphony 4/propriocepts received one of two High Commendations in the ’97 Triennial Paul Lowin Awards; it also received the ’98 Victorian State Sounds Australian Award for Best Work Composed by an Australian. He is particularly pleased to have entries in the Oxford Companion to Music and the Oxford Concise Dictionary of Music, among many other reference volumes. His newer, completed works include the sadness of detail for Boston clarinettist Michael Norsworthy; the blinding access of the grace of flesh for mezzo-soprano and six players - a companion piece for ik(s)land[s] - commissioned by ELISION; three smaller piano works from the Phase Portraits: tiento de medio registro alto, E–330 plays, and tenebroso; a large-scale piano work, passing bells: night, for New York pianist Marilyn Nonken; Blood Music for the Norwegian group asamisimasa; a song commissioned by NMC Records for a forthcoming celebratory release: an Hypallage; and fundamental processes for 10-string guitar, for Norwegian Anders Frisdal. Other recent commissions include a duo, Permutation City for Speak Percussion; and compostela/finisterre for organist Kevin Bowyer. Current projects include several new works: one on words by Aimé Cesaire: un petit mot crabe-c’est-ma-faute; unquiet for solo electric guitar; a continuation of the large-scale work he wrote to celebrate ELISION’s 20th anniversary, Agnî-Prometheus-Lucifer; plenum for clarinet and piano for Rosman and Knoop; a snare-drum solo for the volume the Noble Snare; and two complementary guitar concertos, isles dernières and Ω Point. Articles on his work by Richard Toop have appeared in Contact, Perspectives of New Music (vol.29/2, with a companion CD recording of sulle scale della Fenice), and Contemporary Music Review; he wrote regularly for Soundscapes while it existed, and has been interviewed recently for Context. He has contributed both an interview and articles to Musik & Ästhetik. His music is published variously by United Music Publishers and Red House Editions, Melbourne, and all scores are available from the Australian Music Centre. Passing bells: night : planctus for piano Commissioned by Marilyn Nonken. Flux : chamber ensemble (2016) Commissioned by Kupka's Piano. Piano sonata (solo piano) (2015) Commissioned by Peter de Jager. The blinding access of the grace of flesh : for ensemble with mezzo-soprano (2003) Commissioned by Daryl Buckley. Light-strung sigils : for amplified recorder and six players. (2001) Commissioned by Colin Matthews, Music of Changes.